The PLEXUS allows you to receive data via MADRIX using 1024 DMX channels per device. MADRIX PLEXUS features two 5-pin, female XLR connectors. If you want to use DMX-IN, please use a 5-pin XLR male to 5-pin XLR male gender changer. This chapter describes how DMX-IN can be used to control the MADRIX software remotely. 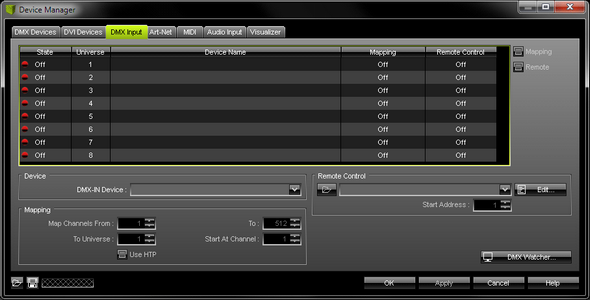 If you want to learn more about directly controlling the MADRIX PLEXUS remotely, please see the chapter Remote Control. Please make sure to enable USB drivers in MADRIX. For more information, see Loading And Enabling Drivers In MADRIX. Now, please connect the MADRIX directly to a free USB 2.0 port of your computer or use the USB power supply (or USB 2.0) and the network connection for Art-Net. If the MADRIX PLEXUS driver has been installed properly, the status LEDs will light up accordingly, as described in the chapter Troubleshooting. Start the MADRIX software now if not yet done. In MADRIX, navigate to the menu 'Preferences' > 'Device Manager...' (or press 'F4'). The first tab 'DMX Devices' shows a list of connected devices which were found in the network. Click this button oíf your device is not shown in the list in order to search for connected devices. 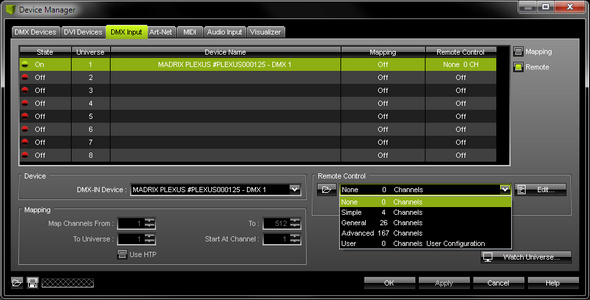 Two list entries will be automatically created for your PLEXUS device, one entry for every DMX port ('DMX 1' and 'DMX 2'). 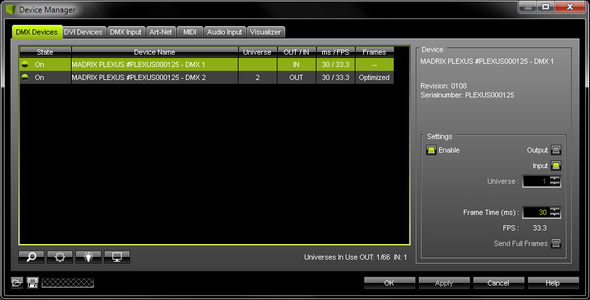 By default, 'Enable' as well as 'Output' is enabled for every DMX port. Please enable now 'Input' for the specific DMX port. Please check if 'Enable and 'Input' are activated! Your PLEXUS device is now configured to input DMX data. In MADRIX, please navigate to the menu 'Preferences' > 'Device Manager...' > 'DMX Input'. Choose an entry in the list ('Universe' 1 to 8). Then, select your input device under 'DMX-IN Device'. Afterwards, select your device in the list again and enable 'Remote' (in the upper right corner). Now, choose one of the input protocols in the section 'Remote Control'. 3 pre-defined standard protocols are already implemented. Choose 'User' if you wish to create your individual remote configuration. For more information and the configurations of the 3 standard protocols, please see the MADRIX Help And Manual. You may also choose a protocol and click 'Edit...' to see the configurations. Close the window with 'OK'. 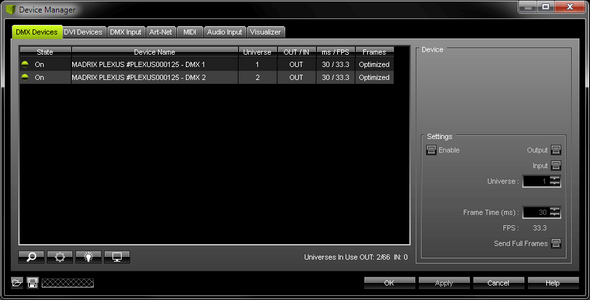 You can monitor incoming or outgoing DMX values on your device in the PLEXUS menus 'Tools' > 'Monitor DMX 1' and 'Tools' > 'Monitor DMX 2'. Please make sure to save your MADRIX Setup after the configuration process. You can find more info (including DMX-Thru) in the MADRIX Help And Manual.